Transcribed from pages 69-70 of the January, 1917 issue of "The Boiler Maker's Journal"
THE accompanying illustration shows an entirely new type of locomotive designed at the Bell Locomotive Works, to be able to use all kinds of cheap fuels, and that must be able to be utilized as an extremely narrow, short and low locomotive, that is smokeless and sparkless, simple to operate and of strong construction. In order to provide such an engine there was eliminated all thought of the regular type of steam dinkey due to its great bulk, the fact that it could not be standardized, that it required a long time to fire up, that it was not powerful for its weight nor economical in fuel consumption, but its good quality of being reliable and long lived was not forgotten. There was a careful consideration given to the gasoline and electric types of locomotives, but after considerable experience with the first it was discarded for reasons too numerous to mention. 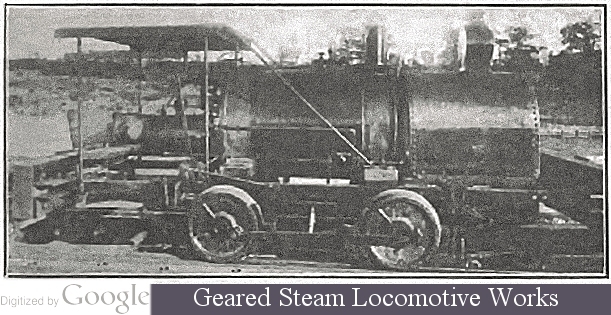 The electric type unquestionably had merit for certain classes of service, but it could not be employed to the advantage in the majority of places, and so this new locomotive was developed as a highly refined and standardized steam locomotive. It will be seen that the machinery or engine parts are all confined to one unit, so small and compact that it can be installed in the narrowest gauge locomotive. The engine unit includes such feature as roller bearings, drop forged parts and all working parts are enclosed in an oil tight dust proof case. It will be seen that the boiler is of the horizontal type with shell and fire box head of one piece of pressed steel and smoke box head welded in. The shell is wound with several layers of piano wire, thus giving it great strength without excessive weight. The tubes are expanded into the front head and brazed into the rear head from the inside of the boiler by a process. The fire is so distributed that it gives maximum heat to the lower tubes and only comparatively low heat to the tubes above the center of the boiler or those tubes not under water. In other words, there are tubes where stay bolts are usually employed and this feature gives superheated steam without the addition of superheaters. There are no stays, seams, or rivets. It is maintained that the boiler plant is extremely compact, absolutely safe, easily cleaned and so designed that all the tubes may be removed and replaced in one unit when necessary in from one to two hours' time. A steam pressure of from 300 to 350 lbs. is carried and at this pressure the factor of safety is at least 10. The boiler may be fired from cold in 10 to 30 minutes, or fired instantly after a one or two hours stand. It is claimed that these features provide a locomotive that will run on any fuel from gasoline and kerosene to crude oil, or coal or wood. On that will give no smoke or sparks when burning kerosene or fuel oil. At the same time a locomotive that is built to standard design, is simple, reliable and compact and may be started quickly. It has the speed of the direct connected locomotive combined with the power of the geared locomotive and has been built as small as two tons and as large as 14 tons up to the present time.